With the development of science and technology, threading device has also undergone some changes, and its traction strength, flexibility, anti-aging, temperature resistance, anti-acid and so have greatly improved the position of the traction head Using a special material, user-friendly 360-degree wheel design, but also can effectively through the elbow, so that construction workers will not feel the trouble encountered in the elbow, a unique connection, making the threader in use even more The convenience, and longer service life. In the installation of dark lines in the building, the guide cable in the pipeline traction, and deployment of communications cables, power cables, network cable, video cable, etc., if the use of threading device can make the operation more simple, which can greatly improve work efficiency , Is a more efficient power construction tools and communications construction tools. If the use of threading device for the laying of the line, there are two main construction steps: ① Laying a reasonable line to the power line, the elbow at the bend is the best use of bending, and then its line pipe fixed; ② either end of the threader through the tube, the other end of the tube pulled out a short section, then, and then need to enter the line of the wire cut about 5 cm each thread, take a bare thread into the threader Head eyelet firmly secured, multiple lines need to enter the same pipe, can be twisted together and wrapped with tape, the last one to pull the end of the threader, and the other can be slow at the other end Slowly route the cable into the conduit. 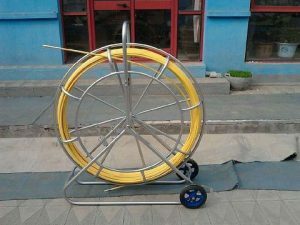 The use of fiber glass duct rodder for the operation of the cable through the tube, even if the bending tube can still wear quickly, greatly shortening the construction time, effectively improve the work efficiency, threading is a good helper.